The young equestrians have just headed back to school, and the chill is starting to come in the morning air now. The schedule has lightened a little since a few weeks ago when all of the vets in the Newmarket office were booking nearly a week in advance for routine calls. Its been a hectic summer over all, and a hot one! Rumblings about where hay is going to come from have been heard out and about with all of the dry heat. I have to say that personally, I’m enjoying putting my fleece on first thing in the morning and not sweating by 9 am, but I know all too soon the snowflakes will fly. This, to me, is the perfect time of year. The summer show season is over and we enjoyed our clients’ successes as we watched the evolution of horse and rider teams from spring through fall, and for some, looking forward to the Royal. Our foaling season has come and finally gone, and breeding season is over for this year. The Newmarket team has had a fairly successful breeding season, and have seen our caseload grow. We are excited with the number of mares we have “in foal”, especially the group of “retired show horse mares” who are older, and who were more difficult to catch. In many cases, it has taken a joint effort from the team, and some HARD work on the part of the clients to get these mares in foal, but we are delighted with the outcome of all of our hard work, and look forward to a big foal crop in the spring. Look out for some client education seminars over the winter on preparing for the 2017 foal crop arrival. Keep in mind your broodmares have different vaccination needs beginning with their Pneumabort vaccinations starting at either 3 or 5 months of pregnancy. While I was driving from Schomberg to Uxbridge one Saturday during a busy on call weekend I began thinking about the cases I had on deck, and it came to me that we should discuss one of my favorite therapies in this blog. I had seen a mild cellulits, a new and active splint, 2 pretty significant soft tissue wounds, a swollen eyelid from some trauma, a raging lymphangitis and more. The emergencies were a bit backed up, and I was having the clients start the treatment before I arrived. I said the following phrases more that weekend than I have said in a very long time – take his temperature and put some cold on it, or take his temperature and cold hose it. To one client (the raging lymphangitis who was toe touching lame and unable to walk out of his stall) I said cold hose it until I get there (and I had him give bute on account of the fever). It would seem like on that weekend (and it was 34 degrees during the day so this seemed appropriate) everything I was looking at just needed the be cooled down. When I arrived on farms, I was amazed at what I saw, and reminded of the pure and simple genius of cold therapy and cold hydrotherapy. 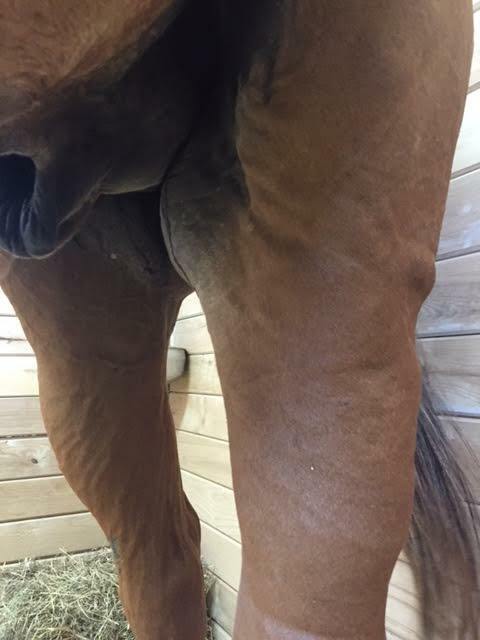 My lymphangitis client (who was on a well) actually cold hosed his horse for over 90 minutes consecutively and do you know what I found when I got there? 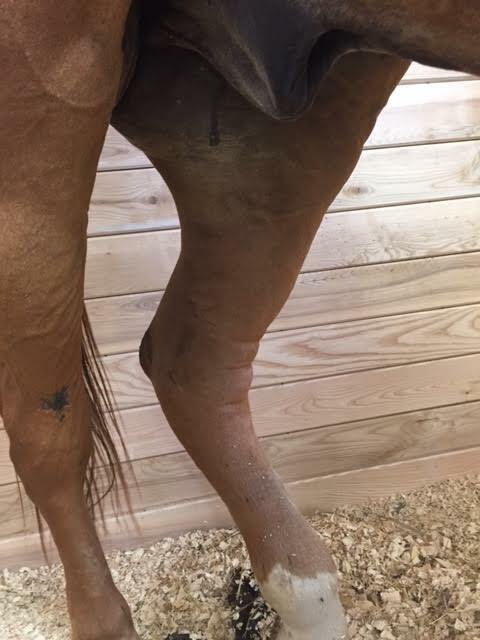 Although the leg was swollen to this horse’s hip and the upper limb still hypersensitive; with only one gram of bute and a ton a cold water – this horse could now walk out of his stall, the skin on the lower leg had actually loosened up as the swelling had already began to reduce by the time I’d arrived, and when we walked the horse out into the yard, he B-lined it for the grass. This client, nearly alone, had reminded me of something perhaps I’d forgotten, or have been taking for granted lately – cold therapy is amazing. Pair it with a client who will give hours of their day to making sure their horse gets the best possible care – priceless – literally priceless (and as long as you don’t have to pay a water bill – this is a CHEAP thing that anyone, no matter your horse experience can do). That client who sat and cold hosed his horse forever until I got there, his name is Don – and Don – you get the compliant client of the month award from Andrea! But as we all know, that’s not the real prize, the real prize is that Don made his horse happy and healthy fast despite a problem that can become much worse and sometimes takes weeks to resolve. What in some cases would have become a month of treatment and bandage changes, was completely resolved in about 5 days. Now, tiny aside – those of you who know me know I’m kind of big on the cold water and ice therapies – and so maybe I’m just using a case to demonstrate my point of view???…Maybe! But, I thought perhaps I could convince a few more of the power of cold if we looked into some literature, and I could explain why we vets, and horsemen for the last 200 years have used Cold therapy as one of the staples of horse care. Proving the efficacy of cold therapy, or cold hydrotherapy had not been an easy task. Although it had been a staple of horsemanship for what seems like eons, we did not really understand the science behind why it seemed to help, or if there was much in the way of side effects. Since about 2000, ice and cold hydrotherapy have become hot topics in the equine veterinary scientific literature. Anyone who has ever placed a burnt finger under cold running water, or put an ice pack on an area of acute trauma freely accepts the reality of benefits cold hydrotherapy has to offer. Explaining the physiology behind these benefits seems to be more of a challenge. As a brief summary; when you apply cold hydrotherapy to an area of acute trauma a cascade of events are trigered,; we restrain the metabolic response of inflammatory cells by reducing further inflammation, and thus alleviate pain. Not all cold is created equal! 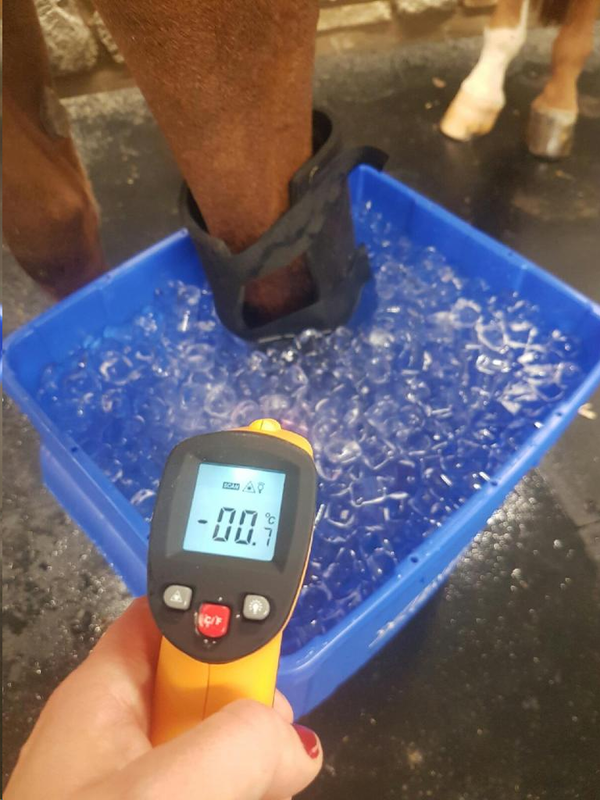 In 2000 a paper was presented at the American Association of Equine Practitioners annual convention comparing deep tissue cooling and warming which I find illustrates the “Not all cold is created equal” theory quite nicely. One of the most interesting findings was that deep tissue measurements dropped by more than 15 degrees C when in ice water immersion, and the entire time the limb was in the ice water the temperature continued to go gradually down until the temperature reached approximately 10 degrees C and then stopped. Once the leg was removed from the ice water immersion, the temperature rose back to normal within 10 minutes. Commercial ice packs were used as a comparison, and when applied to the skin only dropped deep tissue temperature by about 2.5 degrees C. The real challenge with this therapy was that the skin was at its coldest at approximately 2-3 mins into the treatment, and although the skin got quite cool, the deep tissue did not cool beyond a few degrees, and actually started to warm up again 5 minutes after the cold packs had been applied, and continued to warm up (with the ice packs still in place) so that at 30 minutes of ice pack therapy, the deep tissue was just as warm as if no ice had been applied at all. A most recent 2016 article comparing a number of “wet” and “dry” newer technologies still found the ice water slurry to be the most effective at profound deep cooling. Take home message – commercial ice packs are not a great solution to achieve deep tissue cooling, unless you put a new frozen ice pack on the skin every 5 minutes. Though massaging, compressing or coolant circulating dry therapies are more effective than the standard commercial ice pack, ice water immersion remains a far superior method of achieving deep tissue cooling. So how does Cold Hosing fit into what we know? Rather than asking why, if you were anything like me, sometime around the age of 10 your trainer told you to go cold hose a swelling or wound. You stood impatiently asking if you were done yet, to which you were then told “No”! Another 15 minutes went by, and then you were finally allowed to stop. When you saw the improvement in the swelling, it never crossed your mind to ask again “why?”. Cold hosing has just become the thing that horsemen so frequently do. Although not as cold as ice, cold water still offers a significant cooling effect when done over long periods of time, while adding the benefit of massage, and in the case of a wound, the added benefit of rinsing away dirt and debris. There is little scientific evidence for cold hosing, yet scholarly articles cite the many benefits over and over again. The newer research points to the potential benefit of use of hypertonic saline (aka salt water) for use is the spa systems which provide massage, cooling and compression. 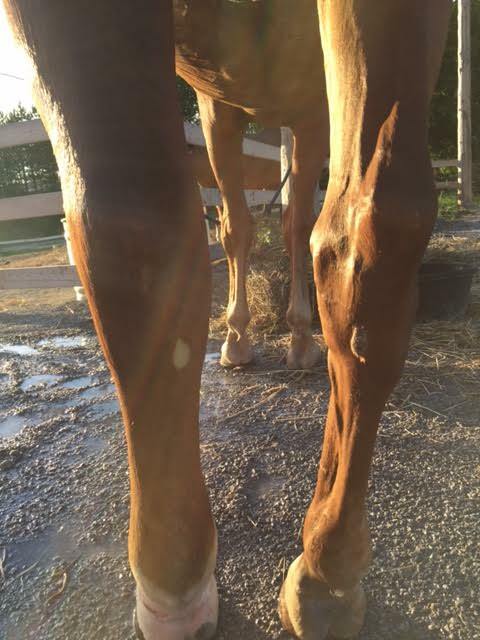 Something to keep in mind when considering all of this is the horses skin and soft tissue. We humans are not able to apply ice to an area, or sit in ice water for hours. Though cryotherapy is being used increasingly in human medicine, it is not through the use of ice baths, as our skin can not sustain the cold temperatures. There is a reason your horse can stand naked for hours in a snowbank and come in absolutely no worse for wear, or perhaps even better, while we would end up in the hospital. Our skin, circulation and tissue tolerance is VERY different. We often think, well – if it works for me – it should work for my horse. Sometimes this is very true, but in other cases our varied physiology makes the outcome very, very different. There are negative side effects to over-cooling a tissue, however we know relatively little about this in horses. 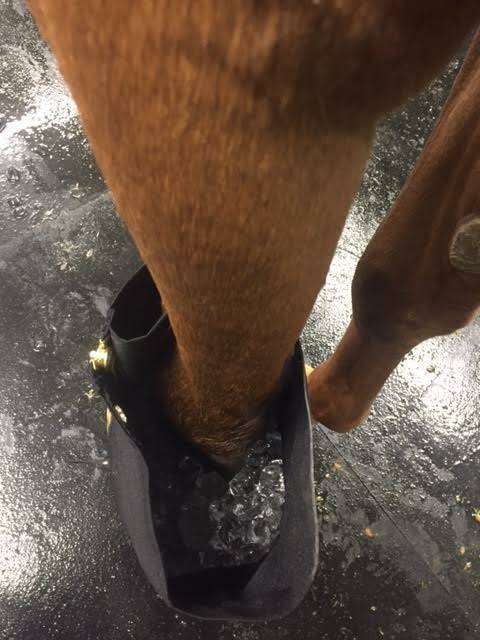 More recent studies in laminitis research have attempted placing acutely laminitic hooves in ice for 72 hours with beneficial effects, yet there are no studies in horses regarding what would happen to a tendon if you iced it for that long – which I think reminds us of our horse in the snowbank analogy. 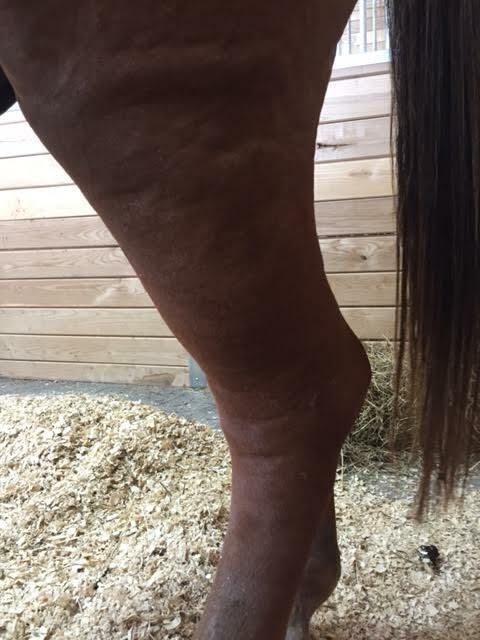 Two things I will caution in this discussion: I have seen horses skin become irritated, and even get infections with significant use of these therapies. Although I think it is most likely that the legs that got infected remained wet and soggy, instead of being well dried and managed to keep the skin happy, this is a risk and something you should watch out for if you are using a lot of cold and/or hydrotherapy. The other thing to watch are the horses’ feet – we all know if we stand a horse in soupy mud for a month it will drastically affect the quality of the hoof. Keep an eye for signs of developing thrush, hoof softening, bruising and wall cracks. Your therapy may be limited by a horse with poorer feet or sensitive skin, and which reinforces that every treatment plan should be re-evaluated often, and monitored for potential side effects. All in all, there is less good scientific proof than I would like to have backing me up on a recommendation I commonly make at least twice weekly, but based on the evidence that is out there, along with a significant amount of positive personal (anecdotal) experience, I will likely continue to strongly encourage the use of ice for the remainder of my career. 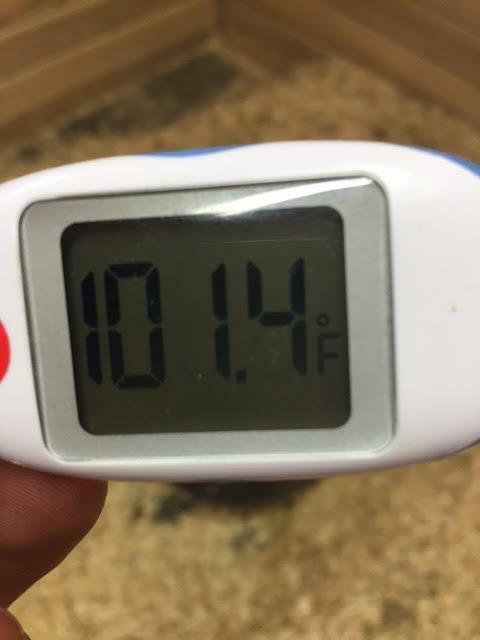 Kaneps, A. Tissue Temperature Response to Hot and Cold Therapy in the Metacarpal Region of a Horse, Proceedings AAEP 2000, Vol 46, 208-213.